The recent fall in the dollar comes after whole milk powder, the country's key commodity export, dropped more than expected in the GlobalDairyTrade (GDT) auction. Dairy product prices have dropped by an average of 10.7 percent in the GDT auction, with a six-year low bringing the price of whole milk powder down 13.1 percent to US$1,848 a tonne. Dairy prices have remained low for a long time now, influenced by higher global supply levels, weaker Chinese demand, and an import ban in Russia. "The GDT auction was again weak with few redeeming features," said ANZ Bank New Zealand senior economist Sharon Zollner and senior FX strategist Sam Tuck, adding "We see downside risks opening up for (the) New Zealand dollar again." According to currency trader Kathy Lien of BK Asset Management in an interview with CNBC, "That's pretty disastrous, because it's the lifeblood of New Zealand, so if their main export is falling in value, that's going to have a direct impact on GDP as well as the incomes of farmers... So the currency trouble, and everyone thinks the Reserve Bank is going to respond with a rate cut next week." The Kiwi has fallen consistently from its high of US88.36c in July 2014, with the extent of this fall not seen since the days of the financial crisis. 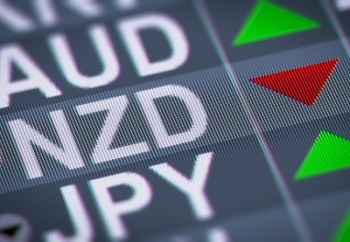 ANZ senior foreign exchange strategist Sam Tuck has said he expects the Kiwi to remain steady against the US dollar, with other analysts forecasting additional falls over the next few months. NZX Milk Futures have already indicated that dairy prices will fall further at their next auction, with the Kiwi also likely to be affected by events in Greece and higher interest rates in the United States. The New Zealand dollar is acting in much the same manner as the Australian dollar, with both countries affected by low commodity prices. According to Brown Brothers Harriman currency strategist Win Thin, "In general, both are grappling with the broad-based commodity selloff, and both are struggling with softer growth and low inflation, which is sending their central banks into easing mode." The New Zealand currency has also fallen against the Australian dollar, the Euro, the British Pound, and the Japanese Yen in recent weeks.